As far as impressive medieval buildings go, Carcassonne’s fortified city would have to rate up there with the best. 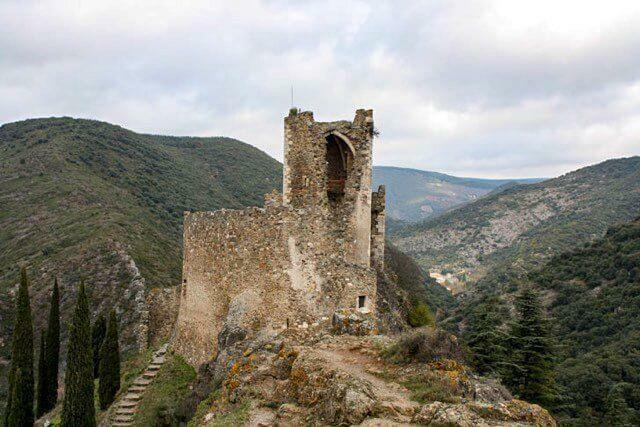 Perched on a rocky outcrop overlooking the river Aude, its thick walls and pointy-roofed watchtowers make an imposing statement on first sight. 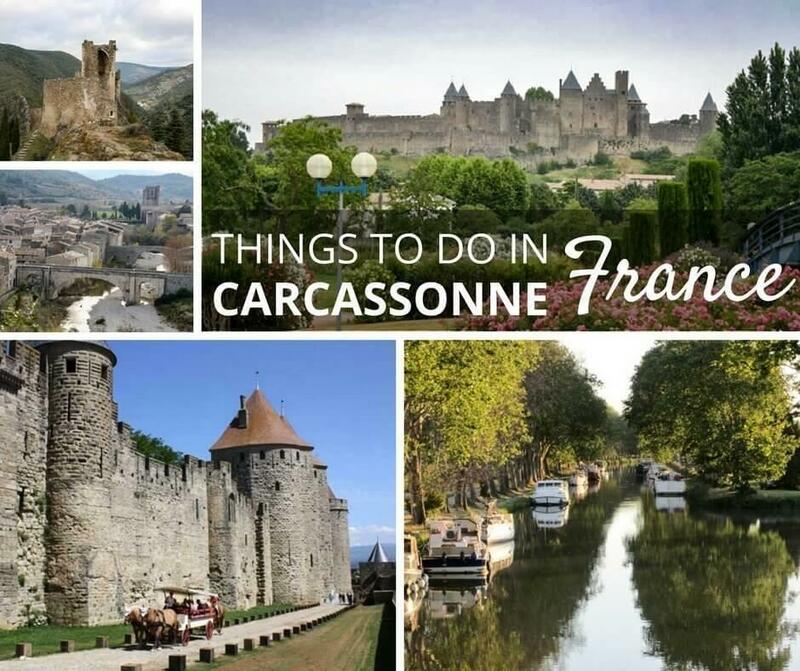 Carcassonne is situated in the Occitanie region (formerly Languedoc-Roussillon) of southern France, and while the medieval citadel is the main attraction, the region offers a plethora of sights and activities and is a worthy place to include in your European holiday. But let’s start with the star attraction. Carcassonne’s heart, Le Cite makes a stunning profile on the skyline when viewed from the Ville Basse. 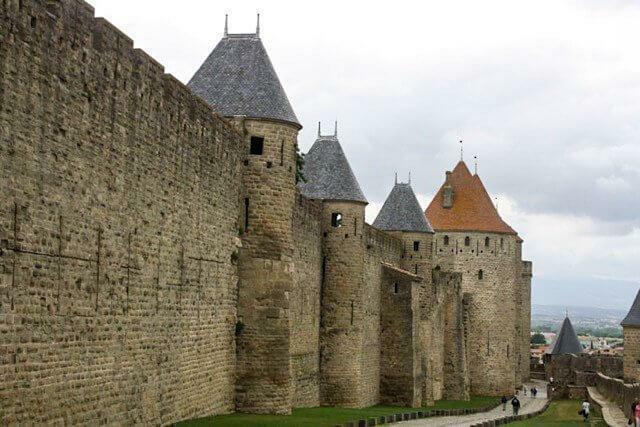 Dating from the 4th century and with three kilometres of ramparts enclosing the medieval city, it’s not surprising Le Cité, as the fortified city is known, is one of the reasons visitors flock to Carcassonne in the south-west of France. Its fairytale appearance nowadays disguises a long and chequered history, and the Cité played a major role in the Albigensian Crusades, a religious war between the Catholic Church and the Occitan Cathars, in the early thirteenth century. After centuries of neglect Le Cité fell into disrepair, and in the early 19th Century the French government ordered it be demolished. A public outcry ensued, and in 1853 the well-known French architect Eugene Viollet-de-Luc began restoration work on the walled city. Viollet-de-Luc wasn’t exactly strict in his interpretation of how the original buildings looked, though, and the arrow slits and pointed watchtower roofs we see today were added merely for aesthetic purposes, not for authenticity! Most visitors to Le Cité enter via the main entrance, La Porte Narbonnaise. Constructed in 1280, its towers have also been adorned with pointy caps, which add to the grand appearance. Once inside, after crossing the drawbridge, it’s like stepping back in time to the Middle Ages. Two thick walls, with crenellated tops, ring the fortress providing what would have been serious protection from invaders. Inside the inner walls, shops, restaurants, houses, and even a couple of hotels, line the narrow, cobbled streets of the medieval city. Also inside the citadel is Saint Nazaire Cathedral – dating from the 11th to 14th Centuries. Beautiful stained glass windows are a feature of the Gothic and Romanesque church. Entry to the main citadel area is free, but if you want to access the Count’s Castle and Ramparts in the inner fortification, guided tours are available at a cost of 9 euro per adult (free for under 18s). Those with a penchant for the gruesome, can visit the Torture Museum (10 euro per adult). The Citadel is open year round (except Jan 1, May 1, Nov 1 & 11, Dec 25) but July 14, France’s National day is, without a doubt, the busiest. As home to the second largest Bastille Day celebrations in France, over 700,000 visitors watch a stunning fireworks display over the citadel from the banks of the Aude River. A visit to Le Cité, which was granted UNESCO World Heritage status in 1997, can easily fill a day, but if you have more time available, Carcassonne has many more worthy sights. Just below the citadel, the 14th century Pont Vieux (old bridge) crosses the Aude river and leads to Carcassonne’s Ville Basse, or lower town. 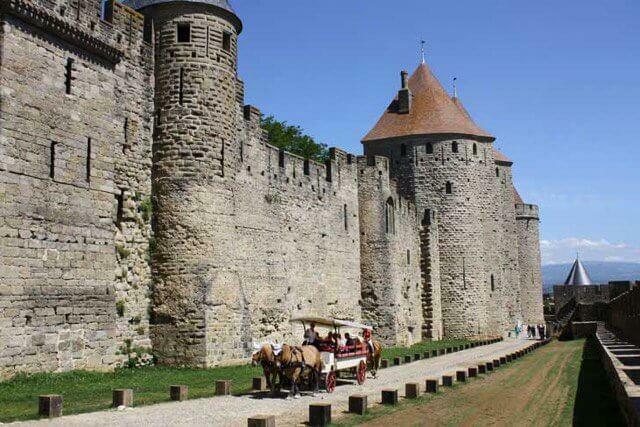 Also dating back to the Middle Ages, this is where the real day-to-day life of Carcassonne takes place. Two of the town’s main markets are held in the centre of the old town. A flower, fruit and vegetable market is held every Tuesday, Thursday and Saturday morning at Place Carnot, while the indoor market in The Halls (the old market hall) offers fresh regional produce including meat, charcuterie, fish, poultry, fruit and vegetables daily except Sunday. Other sights worth visiting in the lower town include the Museum of Fine Art and St. Vincent Church. 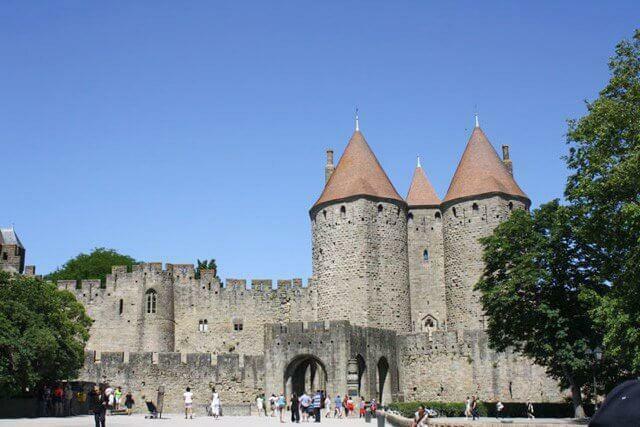 Taste your way through Carcassonne on a Chocolate tour! 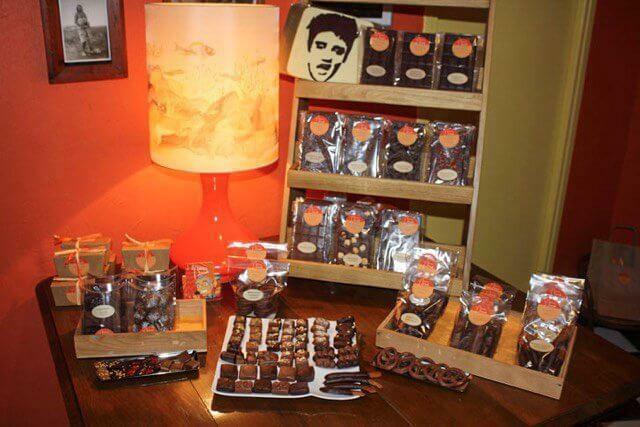 An excellent way to explore some of the Ville Basse is on a chocolate and wine tour run by Cocoa and Grapes. 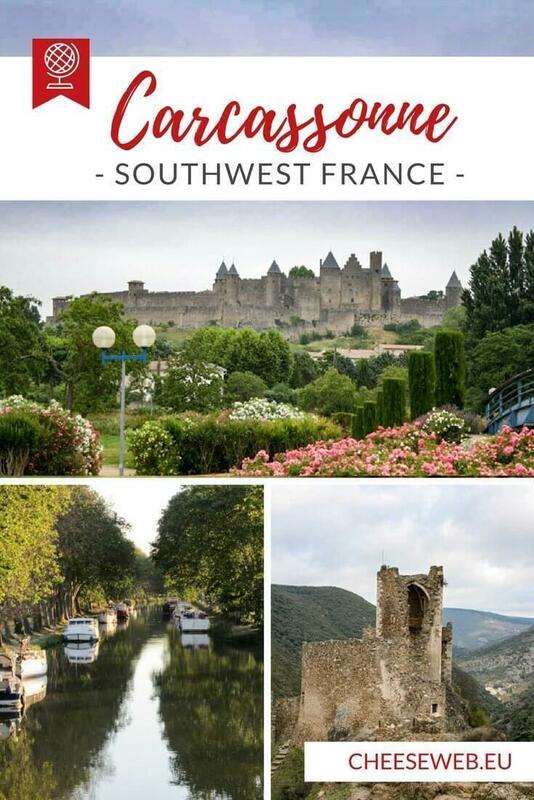 The four-hour walking tour takes you on a stroll around Carcassonne, stopping along the way to sample some of the region’s delicious hand made chocolates and local wines. Throughout the tour, tour guide Brent provides a fascinating insight into Carcassonne’s history and introduces you to some of the local artisan producers in town. 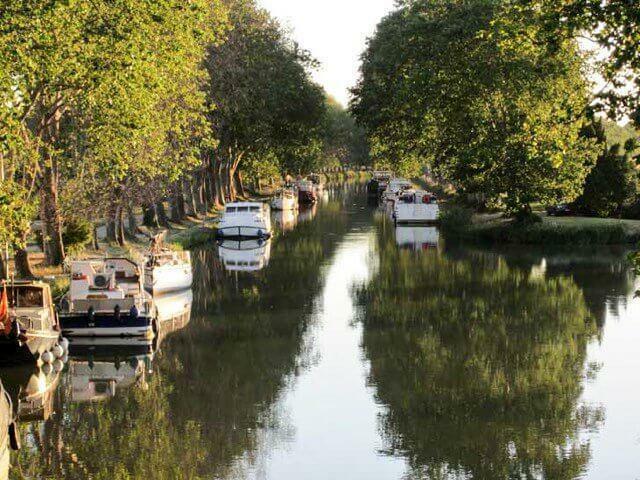 Meandering through town is Carcassonne’s second UNESCO World Heritage Site, the Canal du Midi. Built in the 17th century, this engineering masterpiece was a water super-highway linking France’s Atlantic Coast and Mediterranean Coast. Once, this 240 kilometre-long canal was busy with boats transporting goods; nowadays it’s pleasure craft that ply the waterway. There’s no better way to appreciate the importance of the canal than on a leisurely cruise. At least three cruises operate per day from April to October, and aboard your vessel, you’ll pass through locks and under ancient bridges while also enjoying magnificent views of the medieval citadel on the horizon. The shady towpaths alongside the canal are the perfect place to cycle or take a stroll and watch the passing water traffic. Just as Carcassonne’s Citadel played a role in the crusade against the Cathars in the early thirteenth century, so too did many of the other important Cathar sites in the area. At Lastours, the ruins of four Cathar castles sit atop a mountain overlooking the Orbiel Valley below – the perfect vantage point for the Cathars to spot the approaching Catholics. The four castles are all different sizes (three are believed to date before the Albigensian Crusade), with two almost fully intact. It’s a steep climb to reach the top of the mountain on which the castles are perched, but the views are well worth it. Lastours is less than a 30-minute drive from Carcassonne and is open daily from April to October with limited openings during other months. (Closed during January.) Entry fee is €7 per adult. Just 40 kilometres from Carcassonne is another important Cathar site, the Abbaye de Lagrasse. This Benedictine Abbey, which dates back to the 8th Century, became a powerful force in the crusade against the Cathars five hundred years later. Benoît d’Aligan, the Abbot of Lagrasse from 1224 to 1230, was often called on to act as a mediator between the Cathars and the Catholics. The Abbey is open to the public year round (except mid-December to mid-January). Entry is €4 per adult. 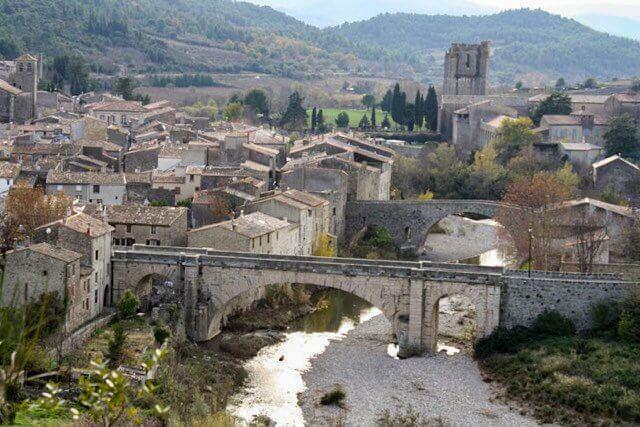 Today the pretty hamlet of Lagrasse is regarded as one of France’s most beautiful villages, and you can easily spend a few hours wandering the cobbled medieval streets and admiring the twin humpback bridges that cross the river Orbieu. 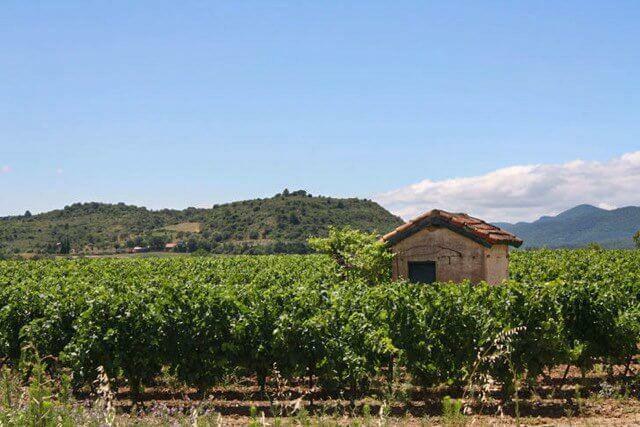 The Languedoc-Roussillon region has for a long while been renowned for its excellent wine (in fact it’s the largest and oldest wine-growing region in the world), and the wines produced around Carcassonne are no exception. A huge array of grape varieties are grown in the area, and numerous producers welcome you to their cellar doors to taste their wines. Wine tours are another great way to meet the local growers and learn more about the local drop. One reason wine growing is so prolific in this part of France is the climate. Boasting over 300 days of sunshine per year and a mild Mediterranean climate, temperatures are perfect for both grapes and visitors! Carcassonne is located in the Occitanie (formerly Languedoc) region of southern France. It is 80 kilometres from Toulouse and 775 kilometres from Paris. 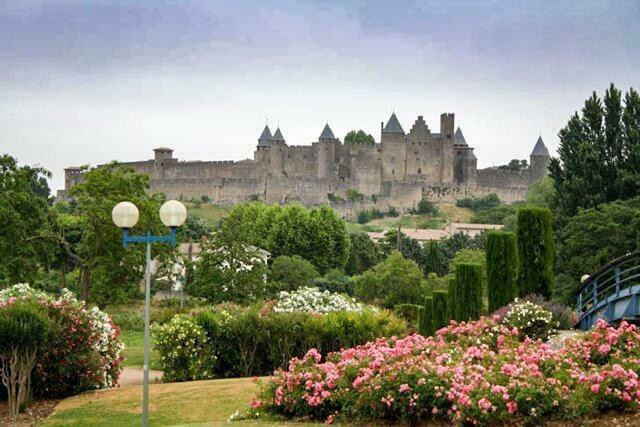 Carcassonne is on the A61 motorway route from Narbonne to Toulouse. The city can be reached by TGV fast train, and Intercity Express trains from Paris (via Montpellier) in around five and a half hours. Toulouse is less than an hour away by rail. Alternatively, travellers can fly into Carcassonne airport from a number of European and UK cities including Frankfurt, Brussels, Dublin and London. 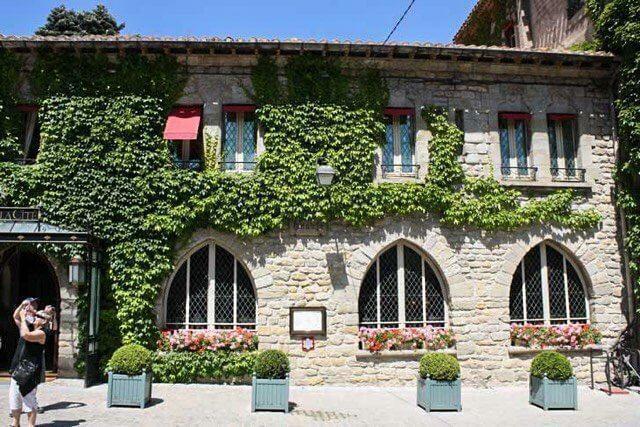 The Hotel de la Cite is a great choice of accommodation in Carcassonne. Travellers can choose from a huge range of accommodation to suit every budget, but one special place worth considering is Hotel de la Cite. Situated in the heart of the medieval city, the hotel offers a unique chance to stay inside a walled fortress. Carolyn Schonafinger is the founder and editor of Holidays to Europe. 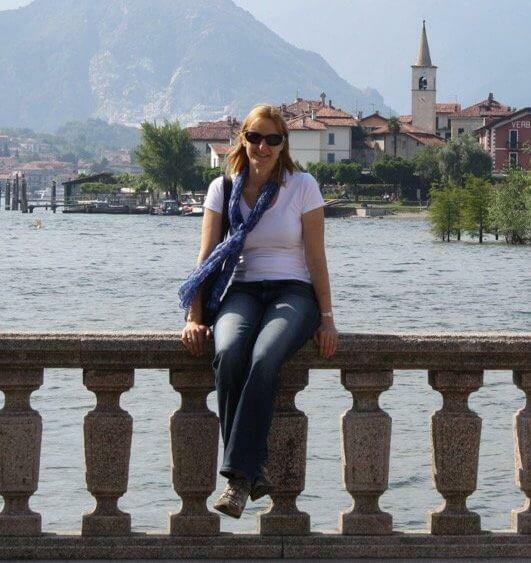 Carolyn travels to Europe annually to satisfy her desire to explore every inch of the continent. With almost a dozen European holidays to her name, Carolyn loves sharing her travel tips and destination ideas with her readers. Her work has been featured in French Provincial Magazine and on websites including FrenchEntree.com and the Eurail blog. You can follow Carolyn’s European travels on the Holidays to Europe Facebook and Twitter pages.